One of the best defenders on BYU’s women’s basketball team is ... a softball player? Steve Griffin | The Salt Lake Tribune | After an outstanding four-year career as a BYU softball player, Caitlyn Alldredge has joined the BYU women's basketball team and quickly become one of the best defenders on the team. BYU's Caitlyn Larsen Alldredge fires to first for an out after scooping up a bunt during the NCAA softball regional against Utah at Dumke Family Field at the U. of U. in Salt Lake City Friday May 19, 2017. Provo • Plenty of BYU student-athletes have tried their hand at two sports the past few years. Most notably, Jennifer Hamson was an All-American in volleyball and basketball, and her sister, Sara is following that same path. Bronson and Corbin Kaufusi played football and basketball, and freshman All-American tight end Matt Bushman gave baseball a try before returning to stardom on the football field. Quarterback Jaren Hall is working out with the baseball team this month and getting positive reviews. Then there’s Caitlyn Alldredge, who concluded four outstanding seasons with the BYU softball team last spring, a career that included West Coast Conference Player of the Year honors in 2017 for the big-hitting infielder. 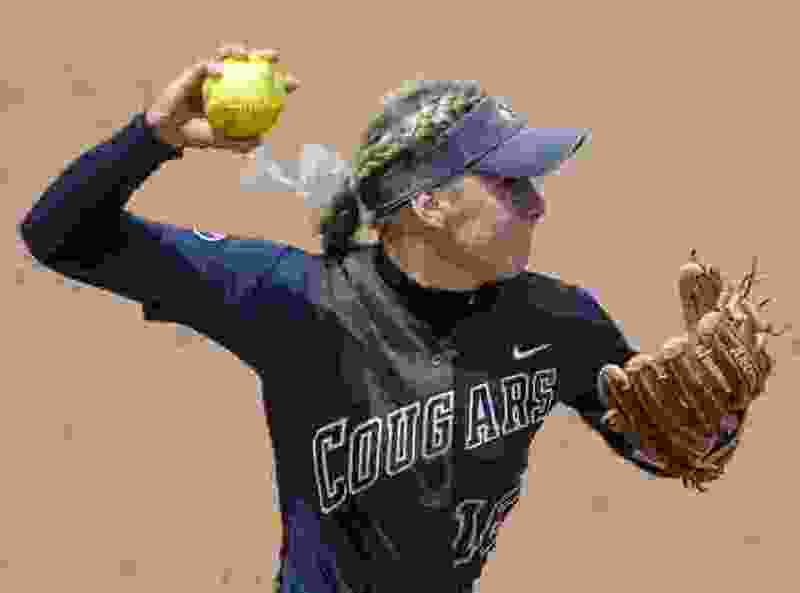 Having exhausted her softball eligibility, Alldredge, a senior, walked on to the women’s basketball team and is making an impact for the 17-5 Cougars, who were ranked No. 25 in the nation before stumbling at Loyola Marymount and Pepperdine last weekend. (Photo courtesy of Jaren Wilkey, BYU photo) BYU guard Caitlyn Alldredge, pictured here in a game at Saint Mary's on Jan. 12, 2019, is using her final season of eligibility to play basketball after starring for BYU's softball team for four seasons. As her softball career was wrapping up last spring with a loss in the NCAA Tournament to Drake, Alldredge asked Senior Associate Athletic Director Brian Santiago about the possibility of joining the basketball team. He put her in touch with head coach Jeff Judkins and assistant coach Dan Nielson, and a few weeks later she was going through summer workouts with the hardwood Cougars. She made the roster, contributed during a three-week trip to Europe last August and then impressed Judkins enough with her defensive tenacity to get some playing time when the season began in November. Alldredge was not known for her defense when she averaged 18.0 points and eight rebounds a game her senior season at Viewmont. But that’s her primary role with the Cougars, and she’s delivered important defensive stops late in games, most notably in BYU’s 70-68 win over then-No. 13 Gonzaga when she kept Zags point guard Laura Stockton from scoring in the final seconds. Alldredge, 5-foot-10, has played in 15 games and started in two. She’s shown some offensive flashes, having made 3 of 7 3-point attempts and scored 15 points in 63 minutes. Judkins said her leadership has been appreciated, because the Cougars have just one other senior, forward Jasmine Moody. “I wish I had her another year because she’s a team player and will do anything to help the team,” he said. Alldredge said her goal is to add a fifth WCC championship ring to the four she won as a member of the Cougars’ softball team. She made national highlight shows with a spectacular diving catch against LMU in which she went head-over-heels into the dugout and finished the grab with a handstand last spring. And she thought the basketball team was ready to be one of the best in the nation. Alldredge’s brother, Biss Larsen, played baseball for Utah, and both her parents — Scott and Lee Ann — graduated from the U. But BYU recruited her harder — in softball — and she is now living out her dream of competing in multiple sports.